Partner CD provides tutorials covering the complete accounting cycle, additional terminology and quizzing practice, and interactive chapter summaries in English and Spanish. Joining the Pieces illustrations present a visual review of the chapter's major concepts, entries, and terms. 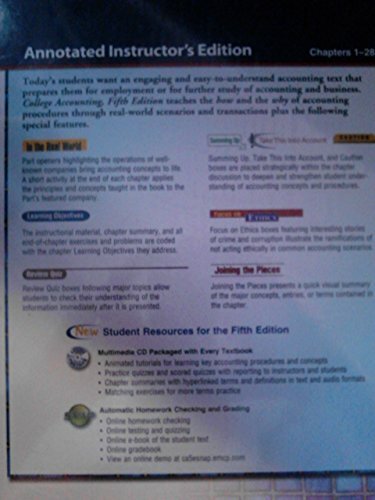 Summaries reinstate each chapter's learning objectives and explain them through detailed examples. Computerized accounting support with Excel, Peachtree, and QuickBooks templates for exercise and problems. Critical Thinking Problems: Challenge Problem, Communications, Team Internet Project, Ethics, and In the Real World challenge students to test their skills and demonstrate their understanding of accounting procedures. These problems can inspire class discussion or be used as writing assignments.